Need to find a pet friendly hotel in Wisconsin Dells WI? Click the Pet Friendly Accommodations Button below! Wisconsin Dells is the family orientated pet friendly playground of Wisconsin. 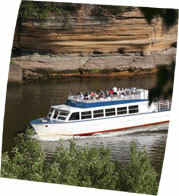 The Dells area is made up of the two communities of Wisconsin Dells and the Village of Lake Delton. This is the land of water parks, lakes, and rivers with dozens of attractions to keep you entertained and busy. Many of the water parks are indoors allowing for year round fun. You and your pet will find pet friendly rooms and cabins along the river and in the Northwoods, which surround the area. It's easy to find pet friendly hotels in Wisconsin Dells with PetTravel.com. Just click the SEARCH button above for a list of pet friendly hotels, motels, bed and breakfasts, small inns, and vacation rentals in Wisconsin Dells. If we have information for other pet friendly services in Wisconsin Dells, a second search button will appear that will include pet friendly beaches, parks, and other fun things to do with your pet. We welcome your emails regarding pet friendly services in your town. Just send an email to info@pettravel.com and we will add them to our database. Come back often as we are always adding new and exciting places for you to visit with your pet. We even offer pet sitters in selected cities who will "petsit" your best friend while you go out to dinner in Wisconsin Dells.